Make your own little robot plush. 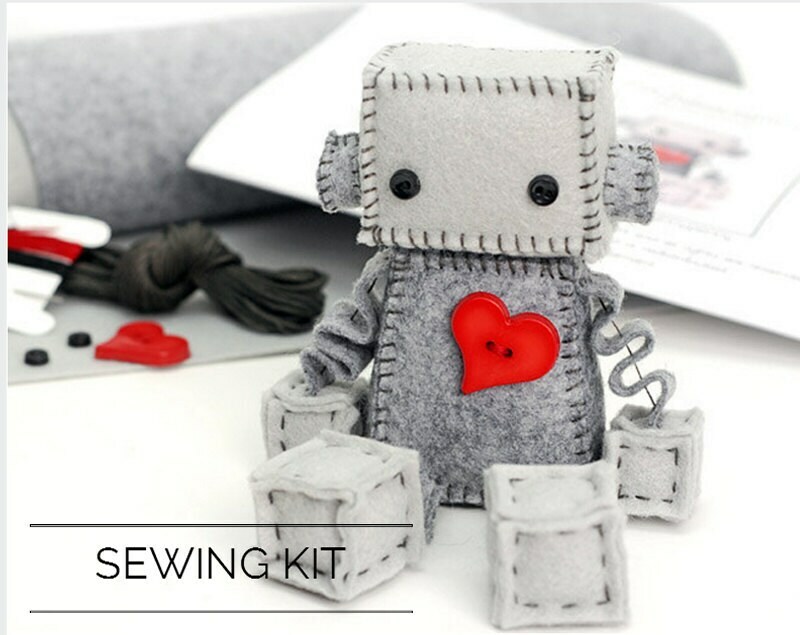 This DIY felt sewing kit contains the supplies you need to make one little felt robot with a big red heart. It is helpful if you have some experience hand sewing, but none is necessary. The kit also makes a darling gift for those that like to DIY their own crafts and plushies. Your finished robot will be about 4 inches tall sitting. You will need to supply your own scissors and stuffing. Tape or pins are helpful for sticking the pattern pieces to your felt as well. The finished robot in the pictures is not included in the kit and is to show you the final project you are making. Stuffed plush robots and the kits to make them are not for young children. Keep in mind that colors may vary slightly from what is displayed on your computer screen. Haven’t tried it yet but it looks complete. Excited. I haven't made this yet, but the instructions seem very clear and easy to follow.